First, Virginia Hyde and I would like to thank Reed Dasenbrock, Hugh Witemeyer, and Art Bachrach for all they have done to promote the Lawrence Ranch and to make its nomination to the National Register a success. The proposal for the National Register of Historic Places nomination was begun in 1998, and the process has proven to be as fascinating as it was complex. It resulted from concerned discussions on an email listserve established by Dr. Charles Rossman, then editor of the D.H. Lawrence Review, regarding the importance of the Ranch particularly to Lawrentian scholars and the need to have it officially designated as an historical landmark on a national scale. We conceived the nomination plan as a proactive effort to assist the University of New Mexico gain recognition for the ranch as a historically significant property worthy of preservation. We believe that having the ranch listed on the National Register is the first necessary step in acquiring outside funding and grants, many of which use the National Register as a standard basis for qualification. National Register listing provides documented assurance that the property retains historical integrity. Having met the N.R. criteria for eligibility, Virginia Hyde and I presented the idea at the 7th International Lawrence conference that summer in Taos and gained unanimous support from the D.H. Lawrence Society of North America. From the beginning, Virginia Hyde and I worked closely with the New Mexico State Historical Preservation Office (SHPO) in completing the form and drafting the two ranch narratives. The “Descriptive Narrative” is a detailed walk-through of all contributing cabins and features of the property including any modifications. (We were aided in this by Theresa Thompson's video tape of the ranch tour). The “Historical Significance Narrative” gives background information on the Lawrences and relates them to the property, including works created at the ranch and Lawrence’s influence on the development of the Taos art colony and on American Literature in general. As a starting guideline for these narratives, the SHPO provided us with sample nominations from the Georgia O’Keeffe House, the Mabel Dodge Luhan House, and the Phillips Ranch District. One of our goals during the writing process was to take extreme care in crafting the biography section to combat a persistent negative aura surrounding the Lawrences, due mostly to incorrect or incomplete information often repeated by the media (for example, former "hippie" and "free love" associations as expressed in the film Easy Rider). We sensed that part of the problem was an attitude based on public misconceptions and popular myth that is unsure of Lawrence’s stature. I’m reminded of an anthology of short stories from The Strand where authors were grouped in categories, but Lawrence stood alone in a chapter titled “Odd Man Out.” A biography centered on the ranch and his American career gave us a unique opportunity to correct some of these slanders and to place him into historical context. We also sought to be inclusive by working together with various people at UNM: Annie Shank (GPSA president), Victoria Kittridge/Wood (ranch project coordinator and author of a Ranch Prospectus presented to UNM’s Executive Board in the summer of 1999), Joe McKinney (University Planner), Terry Gugliotta (University Archivist), and Dr. Hugh Witemeyer and Sharon Oard Warner (English professors who helped provide measurements, accompanied a Regents’ tour of the ranch in 2001, and took a leading role in shepherding the nomination on their end). During the course of the 5-year project, we endeavored to keep the lines of communication open by providing periodic progress reports to both UNM and the Lawrence Society and by submitting copies of the work-in-progress to elicit suggestions. I hope you agree we were successful in combining everyone’s talents in a joint venture with mutual benefits. In addition to writing the narratives, we arranged for the ranch to be carefully photographed on black & white film and printed on archival paper to meet N.R. specifications. Each structure was photgraphed from various angles along with panoramic shots showing scenic vistas and the relation of the cabins to each other. I’d like to thank David Barnes for handling that important aspect with skill and thoroughness, especially since it was done very early in the project and became an important resource. And with his help, the Lawrence Ranch nomination narratives are available on the DHLSNA website for easy access. 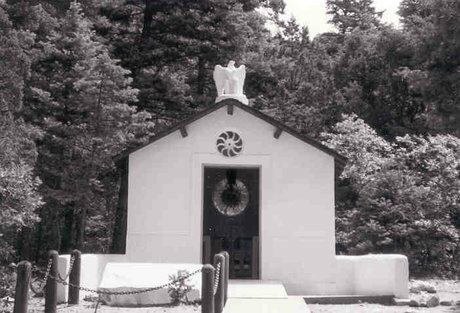 The Lawrence Ranch District (which is the part nominated) covers approximately ten percent of the total 160 acres and includes the ranch’s core of historical cabins, outbuildings, and the Lawrence Memorial. The N.R. guidelines specify that boundaries should strive to be natural as opposed to arbitrary. Due to a lack of detail-oriented scaled maps, we used the U.S. Geological Survey map to define our boundaries for the district. We tried to include significant features such as the spring and a portion of the alfalfa field while at the same time excluding any surrounding modern constructions such as water tanks, storage garages, Kiowa Village, Lobo Lodge, & the campsite. The boundary starts with the property line on the east side, using a gully for the north side, the tree line for the west side and a combination of tree lines and elevation lines for the south side. It’s my hope that one of the future ranch projects will include a proper survey of the property and verification of these boundary lines and the acreage within. As you may know, the nomination has now passed both the state and national review boards, and the Lawrence Ranch was officially entered in the National Register of Historic Places as of January 15, 2004. We believe that achieving historical status through the National Register is in keeping with Frieda’s wishes specified in her deed to maintain ten acres and have it open to the public as a “perpetual memorial” and creative retreat. We also believe historical status serves UNM’s goals for the ranch and will provide many benefits without interfering with the university’s management of the property. Besides honorable recognition and meeting criteria for grant applications, the University is now eligible for federal funds and tax credits. Although this phase of the ranch project is complete, I’m looking forward to hearing future plans and seeing what will be next on the agenda to insure ranch preservation and restoration. I’d like to thank all those who are taking an active interest in the Lawrence Ranch and, in particular, thank Dr. Hyde of Washington State University for her patient expertise and long hours of dedication on the nomination, Dr. Rossman of the University of Texas at Austin, for providing me with scholarship funds to attend the ’98 Taos Conference (where I visited the ranch for the first time), and Dr. Witemeyer of UNM for his support and for conducting this panel to continue our efforts forward.